Politique européenne: proud to join the editorial board! 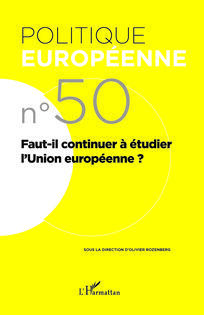 I am proud to join the editorial board of Politique européenne which is the reference scientific journal in European studies in French (and increasingly in English as well). Created in the early 2000s, Politique européenne has been co-directed since last year by two talented colleagues: Dr. Oriane Calligaro (Catholic University of Lille-ESPOL) and Dr. Clément Fontan (UC Louvain). A lot of work ahead while the European construction has never seemed so fragile. The journey promises to be exciting!